The turkey carcass has been picked clean, the stuffing has been stuffed into two-legged birds, and the pumpkin pies polished off. Thanksgiving is over, but I can still remember the great wines we had with the fabulous meal. A special day like Thanksgiving deserves some special wines. Starting with a sparkling pinot noir and ending with Port, our Thanksgiving meal included several terrific wines. 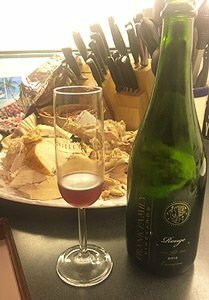 We started with one of the wines I never get tired of drinking: Frank Family Rouge 2012, a sparkling pinot noir from the Carneros region of Napa. The name reflects the color of the wine, a deep, beautiful garnet. It is a festive, fruit-driven wine. Some folks think traditional sparkling wine is a bit too austere, or too acidic, but this wine is loaded with luscious fruit such as cherries and strawberries. This is a dry wine, but all the fruit flavors make it much easier on the palate. The wine is primarily Pinot Noir, with some Chardonnay. For this vintage they added some Petite Sirah. Rouge is $55 and available only at the winery, and sometimes by phone. That’s another good reason to visit their tasting room, one of the best in the Napa Valley. 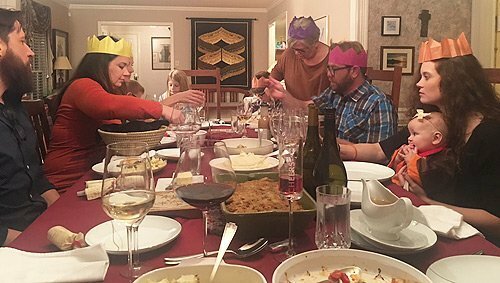 One of our traditions is poppers or crackers, and they always contain paper crowns, which you must wear for the meal. Each popper also has a tiny toy. We had the Rouge as people arrived. I always like sparkling wine as an ice breaker at the start of a dinner or party. It sets the tone for a fun evening. 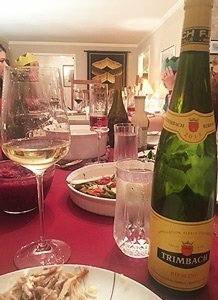 When we started to eat the turkey I switched to Trimbach Riesling from Alsace, France. Other than sparkling wine, it is my go-to wine on Thanksgiving. 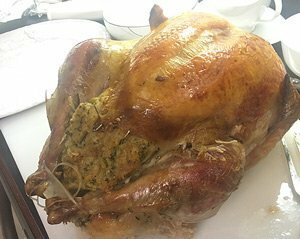 I love the way the crisp mineral flavors play off the rich turkey flavors. It costs about $20, and is available locally. The turkey this year was particularly tasty. I started with a fresh turkey, never frozen. Then I brined it overnight and roasted it in a cooking bag. It turned out flavorful and moist. Even the breast meat was juicy and not dried out. Holiday dinners often are difficult to pair with wines because there are so many different flavors in the side dishes. That’s one reason I like to have multiple wines. But an Alsace Riesling seems to match so many different foods, it is ideal. We had one more white wine, a Turley White Coat 2015 ($35). It is a terrific Marsanne/Grenache Blanc blend and a wonderful food wine. The grapes are Rhone varietals that aren’t planted much in the United States. That’s too bad because they make wonderful wines, rich and full-bodied, with enough acidity to make them great with food. Then it was on to some serious red wines. I love Zinfandel, and I especially love it at Thanksgiving. It is an all-American wine. Although its genealogy can be traced back to Europe, Zin basically is only grown in the U.S. I picked out three from Turley. They make some of the best Zinfandel in the world. And the owner, Larry Turley, grew up and went to medical school in Augusta. He makes mostly single-vineyard wines from old vines. Whenever he can find an old-vine Zinfandel vineyard for sale he buys it. “I’ve never met an old-vine Zinfandel vineyard I didn’t like,” he says. We had one bottle from the Duarte Vineyard in Contra Costa County, 2012; another from the Turley Estate Vineyard in Napa Valley, 2014; and one from the Fredericks Vineyard in Sonoma Valley, 2013. As expected, each was incredible. I’ve never been disappointed by a bottle of Turley Zin, which is one of the reasons I like to serve Turley on special occasions. Everyone is gathered around the table with their paper crowns. The Turley website says the Duarte wine ($79) is an homage to Joe Duarte, a prominent grape grower who first introduced Turley to the vineyards in the Contra Costa area. The wine comes from grapes on vines planted between 1890 and 1930. Sandy soils and ancient vines produce soft, silky tannins. The Estate Zinfandel ($40) is grown in the backyard of the winery and family home in the northern Napa Valley. The vines were planted in 1996 and 2006 and produce robust, seductive wines. The Fredericks Vineyard ($42) was planted in 1937 close to Napa on the Sonoma side of the Mayacamas Mountains along steep, contoured terraces. If you are extremely lucky you might find a bottle or two in wine shops, but mostly Turley wines are available only from their mailing list or from their tasting rooms in Paso Robles and Amador County. Finally, to finish the evening, we opened a bottle of Port, the best way to finish a special meal. Because it was family, I even opened a vintage Port, the rarest Port of all. This was a Quinto do Crasto Vintage Port 1999. It is made from grapes grown on a single quinta, or estate. 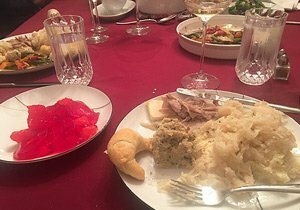 That’s my plate with dumplings, sauerkraut, dressing, a roll and jello. Port can last a long time because brandy is added to the fermented grapes to bring the wine to about 20 percent alcohol. Because the brandy or grape spirits are added to the fermenting grapes early in the process, Port is a fairly sweet wine. That makes it great after dinner, either by itself, or with dessert. I sipped the Port by itself, but others liked it with pumpkin pie, pecan pie or carrot cake. A little bit of Port goes a long way, so we had some left to sip another day. 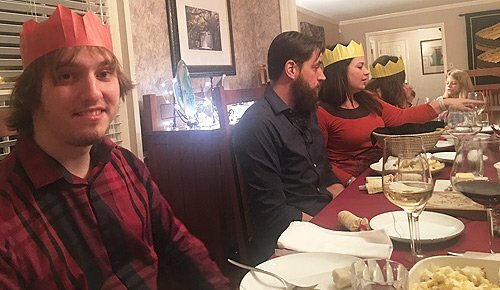 All in all it was another wonderful, memorable Thanksgiving. It’s one of my favorite holidays because I have had so many wonderful memories through the years. It is an essential American family holiday, and you don’t have to do much except eat and talk. What could be better?